As of this time a month ago, we didn’t. 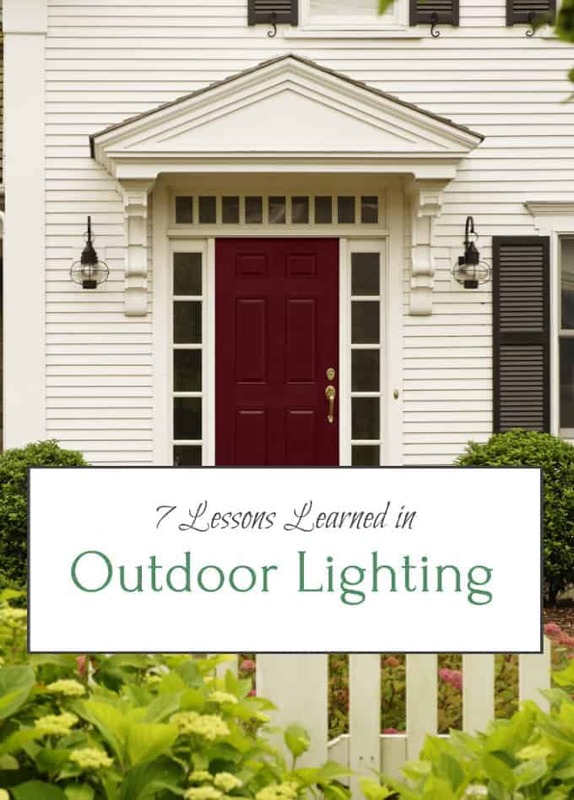 Remember this post on outdoor lighting with a lifetime guarantee? Well, as of a month ago, our house was still as black as pitch to come home to at night. We’d been waiting 5 YEARS to do our outdoor lighting, and I did a ton of research before choosing and planning out our fixtures so that we wouldn’t have to replace them in another five. First I’ll take you through our journey — and if you have an older house like mine, or old trees, you’ll want to stick around — and then I’ll give you the 7 Indispensable Lessons I Learned through the process. Let’s go! This is the outdoor lighting that came with our house. China Chuck-It, $14.99 at your nearest Big Box Home Improvement Store. I had long ago settled on these lovely solid brass light fixtures from New Hampshire’s own Northeast Lantern. I love the lifetime warranty, and the look is perfect for our 1790 home. Northeast Lantern gives you the option of 7 different finishes. I chose dark brass. We have a farmhouse, after all, and I felt the dark brass was a little less blingy. I also chose the 3 candle version for the post lantern. Rewiring anything in an old, old house is no joke. The sconces that originally hung by the door were non-functioning. The wiring had been cut long ago, and there weren’t any electrical boxes behind the fixtures anyway. To get to an electrical source on the other side of the door our amazing jack-of-all-trades-master-of-all Brian Barrett of Brian J. Barrett Construction (Brian is especially good with antique homes) had to rip off part of our door trim so that our amazing electrician-old-wiring-specialist Lenn Johnson could reroute a line beneath the doorway up to a new electrical box. How the heck are we going to do that? In the meantime, we thought we would hang a new door knocker and add a lamp post. Easy? No. To add the door knocker and have the door still look ok after the old, painted over knocker was taken off, Brian had to strip, caulk, and sand the old door. But digging a trench to put a new lamp post in was even harder. We have a 200+ year old maple outside the front door. You can even see it in this old 1850s photo. Also, right in front of the tree where that man and woman are standing in the picture was an enormous invasive shrub about 7 feet tall and wide with roots all entangled in the maple tree’s roots. Bartlett recommended using an air spade, which blows super high pressurized air around roots to blow the dirt out of the way without damaging them. It’s really dirty. I forgot to take pictures, so this is not our house. However, this is what using an air spade looks like. Big mess. This project is getting expensive. Don Cotnoir of NH Monuments with more heavy machinery. Thing 1, fascinated by the crane, in the background. I definitely wanted the post cap, which is that flat square on top of the post. It’s not necessary, and many granite posts don’t have them, but it makes the appearance so much more finished IMO. Since the post was so far back from the street, I wanted it a little taller than normal. I purchased an 8 foot tall post rather than typical 7 feet and made sure that it was the more substantial 7″ x 7″ thickness. (If your post is closer to the street, you might be able to go with a 7′ tall post.) Usually, 30 inches is sunk into the ground. Don finagled mine to be 26 inches in the ground. The extra 4″, plus the 2″ cap brought the post height to 6 feet. Perfect for my 23″ lantern. Lantern complete, but the grass is a debacle. The Handsome Husband was really set on having a spotlight on the house. I had Don make a hole in the bottom of the post for Lenn to wire a spotlight to it, that way the we wouldn’t be tripping or mowing over a ground light stuck in the middle of the lawn. Lenn recommended this light for a more concentrated beam — it directs its light more toward the house and illuminates less of the grass. Now, for my lessons learned. Done well, entry lighting welcomes your loved ones home, complements your house’s architecture, increases security, and helps guests navigate their way to the front door. The possibilities may seem endless, but a few rules of thumb can help you choose the best exterior lighting fixtures for your particular home. Be architecturally sensitive: Regardless of the lighting fixture, make sure its style is in keeping with the rest of your house. Neo-colonial, arts & crafts, modern, Victorian, Federal? 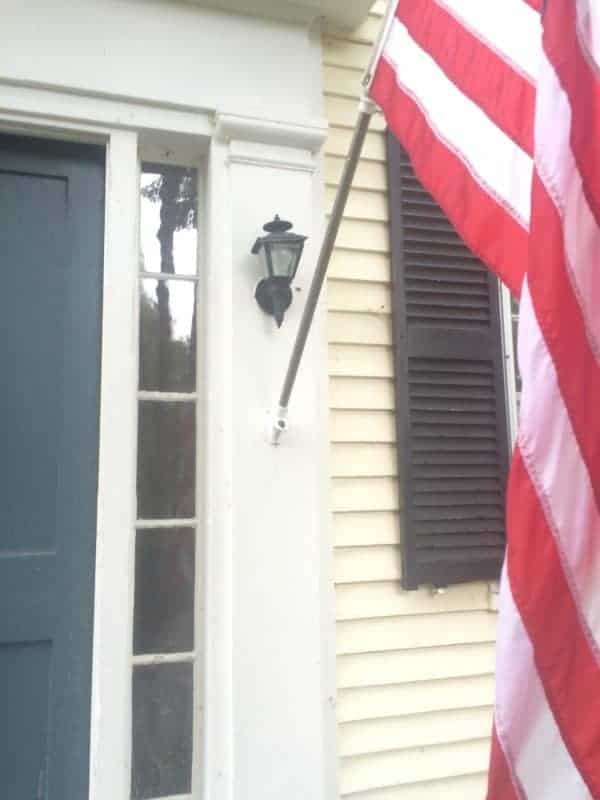 I recently saw someone stick a craftsman style post lantern in front of an 18th century farmhouse. No!!!!!!!! Please, think about your home’s bones. 2. Choose your poison: Evaluate your front door’s particular situation to decide what type of fixture – sconces, pendant, flush mount – you need. 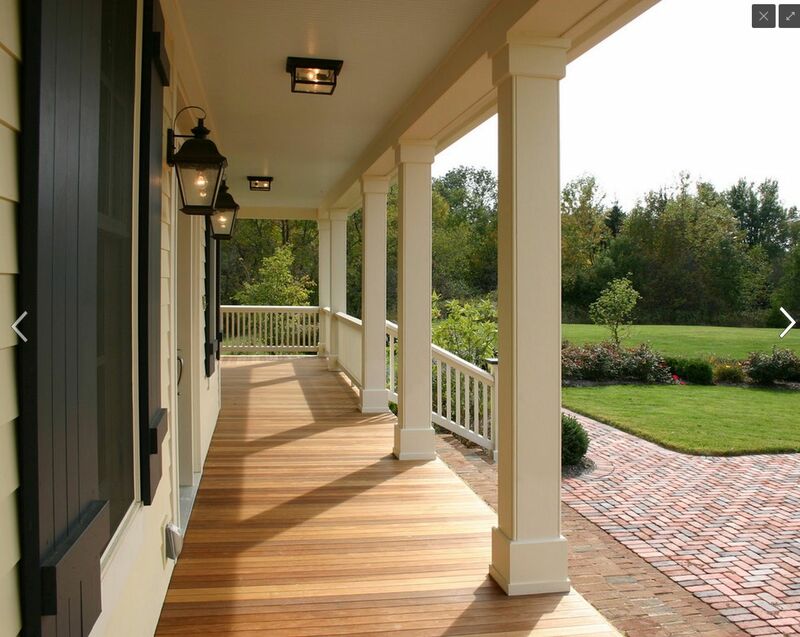 If you have a large entry or porch, a combination of two types may work best. DON’T SKIMP ON SIZE!!!!!! : This is probably the biggest mistake I see. I understand, this stuff is costly, but if you go too small, you will regret it. Then you will have wasted your money when you were hoping to save. Cut out cardboard mock-ups of your choices. Tape them up (the center of the light bulb should be about 66 inches from the floor for a sconce) and then walk backwards 30 ft. to get a perspective on how big they really need to be. In general, sconces look appropriate at ¼ — 1/5th the size of your front door plus the casing. The width of a ceiling flush mount can be up to ¼ the height of the door plus casing in order to look substantial enough. A pendant’s height should be about 1/5th the size of the door plus casing. Notice the difference the bigger sconce makes on the porch in the below pic. Only room for one sconce? Try a little bigger at 1/3 — ¼ size. This link from This Old House is great for determining your proportions. Give your guests some headroom: In general, leave 80” minimum (if not 84”) of space from the floor to the bottom of any overhead fixture, like a pendant or flush mount. Leave 6” of space above the door’s frame for over-the-door wall mounts. 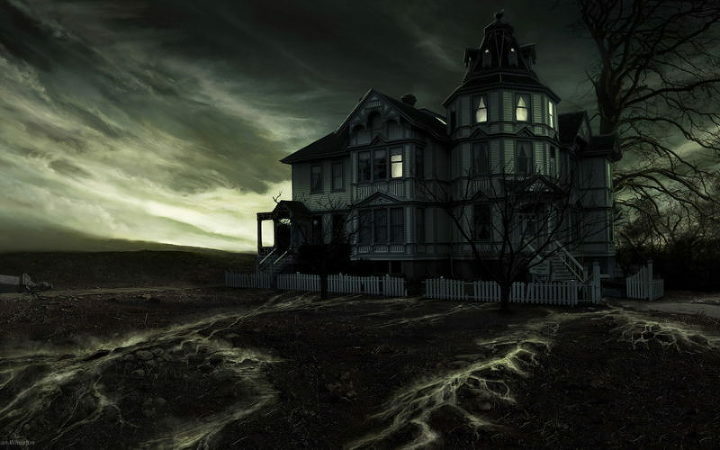 Set a beacon to guide them: Nothing is homier than a post lantern by the drive or front walk. I suggest mocking-up your choices and then walking across the street to make sure of size and perspective. Lantern size should be about ¼ the post height, but the farther from the road your light is, the bigger both it and the post need to be. A 6-foot lamp post may look great right by the road but puny if placed 60 feet up the drive and nearer the house. Make your house a star: Don’t forget a spotlight! Placed at the base of a post lantern or hidden amidst the landscaping, a spotlight will make your house an oasis of welcoming light in a sea of darkness. My dad actually taught me this lesson. You don’t have to have a grand house, like the one below! I grew up in your typical 1970s pseudo-colonial house, and he had it looking wonderful. Be quality conscious: Another Dad lesson. Everyone has a different budget, but keep in mind that exterior lighting will have to brave all the elements of your area. Lesser quality steel and aluminum fixtures will oxidize and rust over time and need to be replaced, whereas brass or copper fixtures can last up to a lifetime. Buy good quality fixtures the first time, and you’ll only cry once about the cost. I’ve already mentioned (a few times) that I love Northeast Lantern. I did a whole blog post when I visited the factory last year. Every piece is handmade in New Hampshire with a lifetime warranty from solid brass. Moreover, they have fixtures for every style of house and can make almost anything you want if you send them a picture. Northeast Lantern used to only sell through lighting stores and designers (you can get them through Home Glow Design! 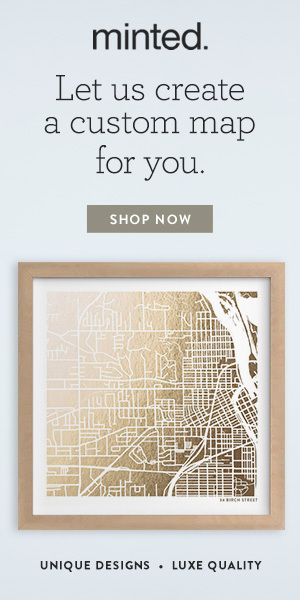 ), but now they are all selling some fixtures through Wayfair. Please note, that the 6 weeks delivery time on that it says on Wayfair is standard, unless you order some of their quick-ship models. They make their fixtures from scratch. Based in Florida, Barn Light Electric makes porcelain enamel lights in every color of the rainbow. They have fabulous barn lights, of course, and a wonderful array of colorful nautical lights as well. I’ve specified some of their blue enamel nautical sconces for an in-progress client bathroom. Are you planning any outdoor lighting projects soon? Any questions? Need recommendations? What do you think of the new look of our home? Next week I’ll be back with … actually, I’m not sure yet. 🙂 If you have a topic you would like me to explore, please let me know! ‘Til next Saturday! What is the paint color on your front door?